VOLGOGRAD, Russia (AP) Two years ago during the European Championship, Harry Maguire was a fan in France watching his beloved England. Now, he’s the first Leicester City player to represent the country at the World Cup since Gordon Banks, England’s great goalkeeper during its one and only triumph in 1966. That’s some turnaround, especially as Maguire only made his international debut last October and plays for a team that hovered in the middle of the Premier League for most of last season. It’s fair to say that, unlike the majority of his England teammates, the softly-spoken Maguire hasn’t played in the really big games, domestically or in Europe. ”It’s been a strange but very exciting time over the last few years and something that I’m ever so proud of,” Maguire said on the eve of the tournament. England’s World Cup opener against Tunisia in Volgograd was the biggest match the 25-year-old defender has ever played. And he more than passed the test, reinforcing his position in the starting lineup for England’s next Group G match against Panama. After some early nerves, he grew stronger during the match and defended solidly. And he was a presence in attack, not least in the lead up to the goal that gave England its 2-1 victory. It was from Maguire’s headed pass that the other Harry – Kane that is – nodded in for England’s winner in stoppage time. 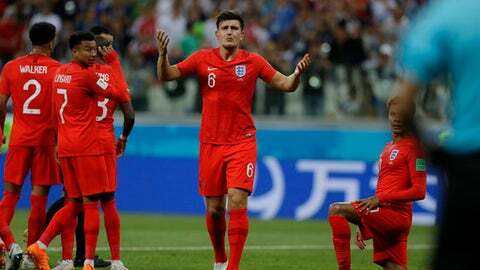 Maguire said getting the late winner could prove to be a bigger positive for the England lineup than winning the game by a comfortable margin. Maguire is exactly the kind of player coach Gareth Southgate wants in his ranks – young and unburdened by the failures of the recent past – as he seeks to change the narrative around the English national team following an era of underperformance. Maguire’s experience against Tunisia will surely help for tougher matches to come. ”I hope (it has) given him a lot of belief,” Southgate said.